DMON is a software tool for embedded system developers to improve their productivity. It enables them to debug applications in a faster and more efficient manner. Test & Debug operations account for 25% of developers’ time and developers consider debug tools to be their most important tools (UBM survey 2013). DMON provides unique supports for efficient development and debugging of system-on-chip solutions where a single chip contains multiple blocks each performing a different function. With upwards of 55% of embedded projects running late (UBM) the demand by management for DMON is obvious. DMON is targeted at debug of embedded applications on system-on-chip (SOC) devices. On-chip processor architectures currently supported include SPARC and ARM. DMON communicates with the target SOC over a dedicated communications link allowing debug without modification of target code or special debug libraries. As DMON is a Java program it runs on multiple platforms including Windows, Linux and Cygwin. 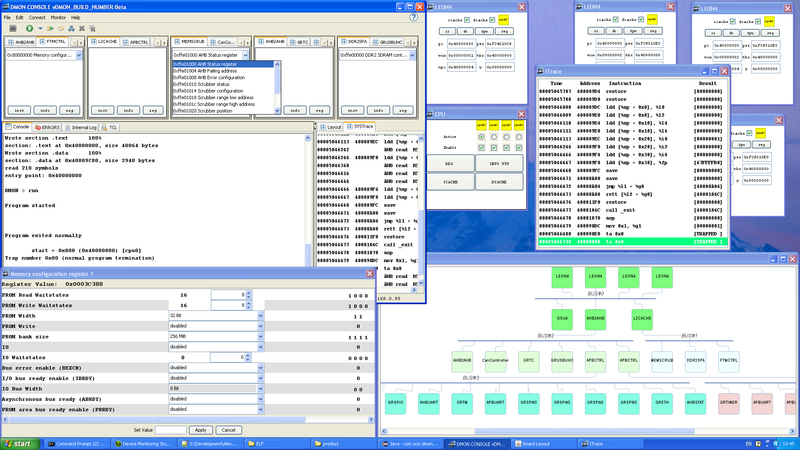 DMON provides a unique GUI interface making it easy for developers to track activity in a multi-processor environment. By clicking on-screen IP blocks the developer can quickly drill down to examine registers and trace data with extensive help on bit definitions and functions for each register. The primary function of a debug monitor is testing of application code and DMON provides a test framework to allow the automation and scheduling of complex test scenarios. Its support for TCL and Python facilitate this process and allow users to build on legacy scripts used by in-house test processes. DMON can be used as a standalone debug tool or integrated with the IDE as a GDB remote target. It provides offline storage of trace information for later analysis. DMON includes a framework to enable developers support proprietary hardware IP and to add commands to manipulate this IP. Where expensive target hardware is in short-supply or where remote teams are developing without on-site hardware DMON allows remote debugging to be carried out on centrally-controlled hardware resources. DMON has been developed in close cooperation with the European Space Agency.